Descriptions and HTML by Joseph O'Dea. Last revised 6 June 2011. Except where noted otherwise, RealVideo clips are by Mick Hyde. MPG clips by Ken Glover. Journal Text: 104:39:32 MPEG Video Clip: (Time-lapse; 1 minute 39 seconds; 3.0MB) by Mick Hyde. Silent, time-lapse landing film, from pitchover, followed by a yaw to the left. Hadley Rille with Hill 305 beyond are in view after pitchover. The film continues to touchdown until after the dust clears, revealing the surface. Journal Text: 104:39:32 RealVideo Clip: (1 minute 49 seconds; not realtime) by Ken Glover. Clip from the NASA film Apollo 15: In the Mountains of the Moon. Opens with Jim Irwin announcing "P64!" at 7,000 feet. A film narrator speaks briefly, followed by the descent to the surface and post-landing reaction shots of mission control. Journal Text: 104:40:06 MPEG Video Clip: (2 minutes 37 seconds; 20.3 MB) by Kipp Teague. Landing clip with good quality video and audio, from 104:40:06 at 3,000 feet to 104:42:40, just after touchdown. Voice of Jim Irwin calling out the numbers during descent, with occasional remarks from Dave Scott and capcom Ed Mitchell. 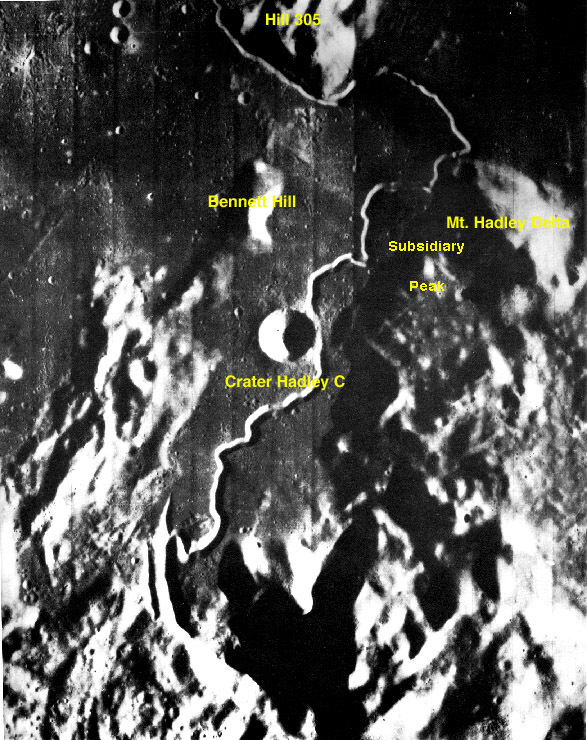 Hill 305 is visible in the background until 2,000 feet and Hadley Rille is visible until 400 feet altitude. Slight ground dust appears at 120 feet and really thickens below 60 feet. After Irwin announces probe contact at 8 feet, the lunar module shadow on the surface shows the spacecraft dropping suddenly at engine shutdown then tilting backwards on contact with the uneven ground. The dust clears almost instantly and applause is heard from Houston after Scott announces the landing. Journal Text: 104:40:06 QuickTime Video Clip: (2 minutes 37 seconds; 1.8 MB) by Peter Dayton. QuickTime compressed version of the Teague digitization above. Journal Text: 119:52:36 2 minutes 45 seconds (RealVideo Clip: 0.7 Mb or MPG clip: 25 Mb ). Both clips by Ken Glover. First television pictures of the EVA: view of the ladder and the slanting lunar surface. Judging from the slant, the camera is tilted about 45 degrees to the left causing the ground to fill diagonally the bottom left corner of the picture. The astronauts can be heard discussing the jettison bag and lunar equipment conveyor (LEC). Scott has not yet descended into camera view. Journal Text: 119:55:42 2 minutes 47 seconds ( RealVideo Clip: 0.7 Mb or MPG Video Clip: 25 Mb ). Both clips by Ken Glover. Scott emerges into view, feet first, descending the ladder. On the footpad, he looks about then takes his first steps on the surface, exploring his mobility. He reports on the condition of the lunar module and accounts for its tilt by describing the uneven ground on which they've landed. CapCom Joe Allen remarks on the extraordinary quality of the television picture. Journal Text: 119:58:00 2 minutes 50 seconds ( RealVideo Clip: 0.7 Mb or MPG Video Clip: 25 Mb ). Both clips by Ken Glover. Journal Text: 120:00:31 2 minutes 46 seconds ( RealVideo Clip: 0.7 Mb or MPG Video Clip: 25 Mb ). Both clips by Ken Glover. Journal Text: 120:02:47 QuickTime Video Clip: (59 seconds; 4.1MB). Jim Irwin's descent to the surface, from 120:02:47 to 120:03:42. With Scott in the background, Irwin descends the ladder, almost falling down as he reaches the footpad. Because the lunar module is tilting backwards, the pad is off the ground and is unstable, swivelling under Irwin. He can be seen swinging off-camera to the left of the picture, holding the ladder for support with his right hand to prevent a fall. Just before that stumble, his face is partly visible and his Snoopy helmet is quite clear inside his helmet. On the surface, Scott tells him to pull his visor down then deploys the antenna on top of Irwin's life support system. They discuss the "glass ball" rock on the ground and how black their boots have become already from the dust. Scott goes off-camera to the right to get the television camera tripod, then Irwin also goes off to the right to collect the contingency sample. Journal Text: 120:03:30 2 minutes 48 seconds ( RealVideo Clip: 0.7 Mb or MPG Video Clip: 25 Mb ). Both clips by Ken Glover. Journal Text: 120:06:18 2 minutes 47 seconds ( RealVideo Clip: 0.7 Mb or MPG Video Clip: 25 Mb ). Both clips by Ken Glover. Journal Text: 120:09:16 2 minutes 47 seconds ( RealVideo Clip: 0.7 Mb or MPG Video Clip: 25 Mb ). Both clips by Ken Glover. Journal Text: 120:11:45 QuickTime Video Clip: (1 minute 27 seconds; time-lapse; 4.8MB). High-speed, time-lapse video of the rover deployment. Irwin climbs up to the porch to pull a lanyard to release the rover. It tilts a little away from the lunar module. He descends to the surface and the astronauts release the car onto the ground by pulling on other lanyards. 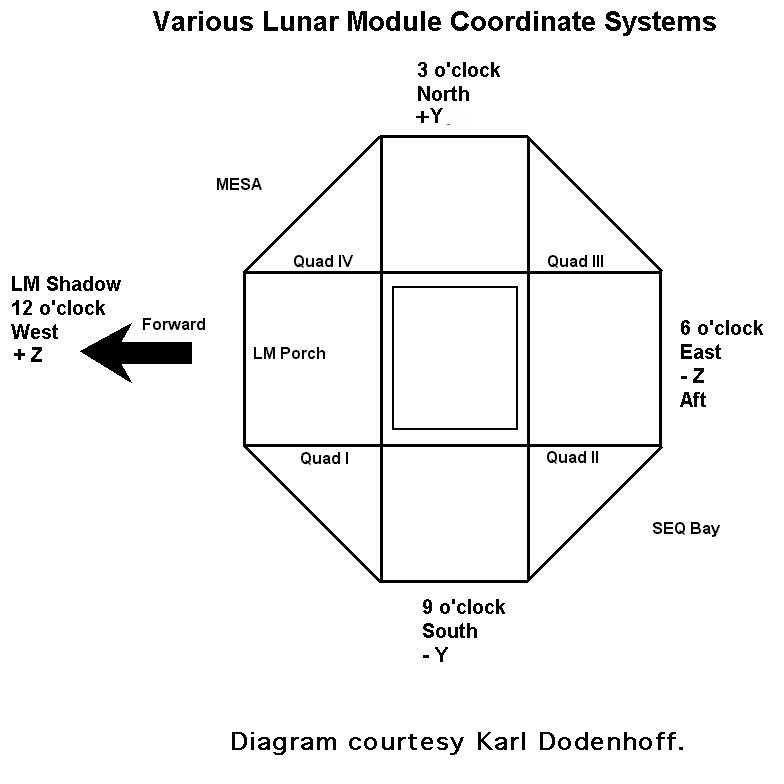 They set up the rover then lift and turn it to its left, pointing east behind the lunar module. Scott climbs on and drives away behind the lunar module, going off-camera to the left, or north. Journal Text: 120:11:56 2 minutes 47 seconds ( RealVideo Clip: 0.7 Mb or MPG Video Clip: 25 Mb ). Both clips by Ken Glover. Journal Text: 120:11:56 QuickTime Video Clip: (2 minutes 50 seconds; 8.6MB) by Gary Neff. 16-mm film clip of Apollo 16's Charlie Duke at the Marshall Space Flight Center at an early demonstration of rover deployment. This clip is referred to in the Journal discussion following 120:12:58. It is also discussed at the bottom of the Post-SEVA section. Journal Text: 120:14:44 2 minutes 49 seconds ( RealVideo Clip: 0.7 Mb or MPG Video Clip: 25 Mb ). Both clips by Ken Glover. Journal Text: 120:17:27 1 minutes 23 seconds ( RealVideo Clip: 0.4 Mb or MPG Video Clip: 12 Mb ). Both clips by Ken Glover. Journal Text: 120:18:48 RealVideo Clip: (3 minutes 15 seconds) by Ken Glover. Journal Text: 120:22:01 RealVideo Clip: (2 minutes 55 seconds) by Ken Glover. Journal Text: 120:25:07 RealVideo Clip: (3 minutes 18 seconds) by Ken Glover. Journal Text: 120:28:59 RealVideo Clip: (3 minutes 12 seconds) by Ken Glover. Journal Text: 120:31:33 RealVideo Clip: (2 minutes 29 seconds) by Ken Glover. Journal Text: 120:33:51 RealVideo Clip: (2 minutes 21 seconds) by Ken Glover. Journal Text: 120:36:20 RealVideo Clip: (2 minutes 55 seconds) by Ken Glover. Journal Text: 120:39:40 RealVideo Clip: (3 minutes 4 seconds) by Ken Glover. Journal Text: 120:40:49 QuickTime Video Clip: (58 seconds; 3.1MB). High-speed, time-lapse sequence shows the astronauts loading tools, equipment and antennae onto the rover. Journal Text: 120:42:29 RealVideo Clip: (2 minutes 41 seconds) by Ken Glover. Journal Text: 120:44:45 RealVideo Clip: (3 minutes 7 seconds) by Ken Glover. Journal Text: 120:48:05 RealVideo Clip: (3 minutes 3 seconds) by Ken Glover. Journal Text: 120:51:13 RealVideo Clip: (2 minutes 50 seconds) by Ken Glover. Journal Text: 120:53:49 RealVideo Clip: (2 minutes 4 seconds) by Ken Glover. Journal Text: 121:03:04 RealVideo Clip: (1 minute) by Ken Glover. Clip from the NASA film Apollo 15: In the Mountains of the Moon showing Ed Fendell in Houston operating the rover television camera during Station 2 activities. The clip contains views from both mission control and the moon where the astronauts are seen collecting surface samples and drilling core samples. Journal Text: 121:05:30 RealVideo Clip: (2 minutes 47 seconds) by Ken Glover. Journal Text: 121:08:48 RealVideo Clip: (2 minutes 15 seconds) by Ken Glover. Journal Text: 121:10:55 RealVideo Clip: (2 minutes 1 seconds) by Ken Glover. Journal Text: 121:12:27 RealVideo Clip: (3 minutes 13 seconds) by Ken Glover. Journal Text: 121:15:38 RealVideo Clip: (2 minutes 41 seconds) by Ken Glover. Journal Text: 121:18:24 RealVideo Clip: (2 minutes 50 seconds) by Ken Glover. Journal Text: 121:20:55 RealVideo Clip: (2 minutes 29 seconds) by Ken Glover. Journal Text: 121:23:32 RealVideo Clip: (1 minutes 15 seconds) by Ken Glover. Journal Text: 122:12:27 RealVideo Clip: (46 seconds) by Ken Glover. Journal Text: 122:13:15 RealVideo Clip: (40 seconds) by Ken Glover. Journal Text: 122:14:50 RealVideo Clip: (2 minutes 26 seconds) by Ken Glover. Journal Text: 122:17:16 RealVideo Clip: (2 minutes 38 seconds) by Ken Glover. Journal Text: 122:16:36 to 122:17:10 QuickTime Video Clip: (1 minutes 12 seconds; 868KB) by Peter Dayton. The rover camera pans clockwise across the ground showing a variety of rocks and a mountain slope in the background. It tilts to reveal background hills. The rille appears as the camera continues right and finally it comes to rest on the rover, showing the right rear wheel guard and Irwin's seat. Off-camera throughout, the astronauts can be heard discussing their sampling experiences. Journal Text: 122:19:39 RealVideo Clip: (2 minutes 50 seconds) by Ken Glover. Journal Text: 122:21:53 RealVideo Clip: (3 minutes 10 seconds) by Ken Glover. Journal Text: 122:24:57 RealVideo Clip: (1 minutes 20 seconds) by Ken Glover. Journal Text: 122:38:53 RealVideo Clip: (2 minutes 50 seconds) by Ken Glover. Journal Text: 122:41:31 RealVideo Clip: (2 minutes 27 seconds) by Ken Glover. Journal Text: 122:42:28 to 122:43:57 QuickTime Video Clip: (1 minute 13 seconds; 877KB) by Peter Dayton. Irwin scoops a couple of soil fillet samples around the Station 2 boulder, a three-foot rock with a substantial fillet on the downslope side, and with the gnomon at its right in this rover camera view. The camera zooms back to show Jim pouring his scooped sample into the collection bag held by Dave. The camera then pans right to examine a crater in the foreground, perhaps 7-8 feet diameter and 3 feet deep. Journal Text: 122:44:00 RealVideo Clip: (2 minutes 52 seconds) by Ken Glover. Journal Text: 122:44:24 QuickTime Video Clip: (1 minute 15 seconds; 907KB) by Peter Dayton. The rover camera is used to examine the rille in this clockwise pan. While the camera looks northwest along the length of the rille, parts of the western slope are in shadow but much of the wall and many boulders can be seen; the east wall is well-lit; the floor is also clearly visible. The camera is used to the limit here to explore, including panning, tilting, and zooming. The camera zooms out and continues its pan to the right, finding the bend in the rille where it curves west in the foreground, and the western face of Mount Hadley in shadow in the background. Meanwhile, the astronauts are collecting soil off-camera beside the Station 2 boulder and are preparing to sample the rock itself. Journal Text: 122:46:41 RealVideo Clip: (1 minutes 43 seconds) by Ken Glover. Journal Text: 122:48:10 RealVideo Clip: (3 minutes 7 seconds). Journal Text: 122:51:14 RealVideo Clip: (2 minutes 50 seconds). Journal Text: 122:53:57 RealVideo Clip: (2 minutes 41 seconds). Journal Text: 122:56:30 RealVideo Clip: (2 minutes 58 seconds). Journal Text: 122:59:24 RealVideo Clip: (3 minutes 4 seconds). Journal Text: 123:02:23 RealVideo Clip: (2 minutes 44 seconds). Journal Text: 123:04:59 RealVideo Clip: (2 minutes 44 seconds). Journal Text: 123:07:37 RealVideo Clip: (3 minutes 10 seconds). Journal Text: 123:09:15 to 123:10:35 QuickTime Video Clip: (1 minute 22 seconds; 991KB) by Peter Dayton. Dave photographs and watches Jim hammer in a double core sample tube. Jim begins by pushing the core in manually then applies 35 hammer blows prompting capcom Joe Allen to call him an iron man. The pictures brightens and improves after 45 seconds when the camera iris is opened up. Jim extracts the core without difficulty. Journal Text: 123:10:30 RealVideo Clip: (1 minutes 43 seconds). Journal Text: 124:05:10 RealVideo Clip: (26 seconds). Journal Text: 124:32:29 RealVideo Clip: (2 minutes 44 seconds) by Ken Glover. Journal Text: 124:34:04 RealVideo Clip: (2 minutes 41 seconds) by Ken Glover. Journal Text: 124:36:32 RealVideo Clip: (2 minutes 44 seconds) by Ken Glover. Journal Text: 124:39:08 RealVideo Clip: (2 minutes 47 seconds) by Ken Glover. Journal Text: 124:41:43 RealVideo Clip: (2 minutes 32 seconds) by Ken Glover. Journal Text: 124:44:11 RealVideo Clip: (2 minutes 35 seconds) by Ken Glover. Journal Text: 124:46:07 RealVideo Clip: (2 minutes 38 seconds) by Ken Glover. Journal Text: 124:47:53 QuickTime Video Clip: (43 seconds; 525KB) by Peter Dayton . Dave decides to play with low gravity, but it plays with him. Holding the heat flow experiment (HFE) dust cover in his left hand, he bends sharply to his right and uses the universal handling tool to pick up the HFE pallet. Moving a few feet to the right and transferring the pallet to his left hand, he invites capcom Joe Allen to watch as he performs a demonstration. He twists and flings the pallet and dust cover into the air but, while they fly off-camera, he loses his balance and falls onto his right arm, extended to the ground to break his fall. The recovery is more spectacular than the fall. His twisting momentum carries him round and he manages to bounce back up from his extended arm off the ground, twisting up to a standing position. The camera pans left and finds Jim at the rover. Journal Text: 124:49:38 RealVideo Clip: (2 minutes 35 seconds) by Ken Glover. Journal Text: 124:51:13 RealVideo Clip: (3 minutes 7 seconds) by Ken Glover. Journal Text: 124:53:56 RealVideo Clip: (2 minutes 52 seconds) by Ken Glover. Journal Text: 124:56:43 RealVideo Clip: (2 minutes 38 seconds) by Ken Glover. Journal Text: 124:59:13 RealVideo Clip: (2 minutes 41 seconds) by Ken Glover. Journal Text: 125:01:40 RealVideo Clip: (2 minutes 41 seconds) by Ken Glover. Journal Text: 125:04:16 RealVideo Clip: (2 minutes 58 seconds) by Ken Glover. Journal Text: 125:07:06 RealVideo Clip: (2 minutes 1 seconds) by Ken Glover. Journal Text: 125:08:59 RealVideo Clip: (3 minutes 30 seconds) by Ken Glover. Journal Text: 125:12:43 RealVideo Clip: (3 minutes 10 seconds) by Ken Glover. Journal Text: 125:15:29 RealVideo Clip: (3 minutes 1 seconds) by Ken Glover. Journal Text: 125:18:20 RealVideo Clip: (2 minutes 27 seconds) by Ken Glover. Journal Text: 125:20:36 RealVideo Clip: (2 minutes 52 seconds) by Ken Glover. Journal Text: 125:23:15 RealVideo Clip: (3 minutes 21 seconds) by Ken Glover. Journal Text: 125:28:25 RealVideo Clip: (2 minutes 58 seconds) by Ken Glover. Journal Text: 125:29:16 RealVideo Clip: (2 minutes 32 seconds) by Ken Glover. Journal Text: 125:31:40 RealVideo Clip: (2 minutes 38 seconds) by Ken Glover. Journal Text: 125:34:15 RealVideo Clip: (3 minutes 59 seconds) by Ken Glover. Journal Text: 143:57:17 RealVideo Clip: (2 minutes 50 seconds) by Ken Glover. Journal Text: 143:59:46 RealVideo Clip: (2 minutes 12 seconds) by Ken Glover. Journal Text: 144:02:00 RealVideo Clip: (2 minutes 44 seconds) by Ken Glover. Journal Text: 144:04:36 RealVideo Clip: (2 minutes 50 seconds) by Ken Glover. Journal Text: 144:07:14 RealVideo Clip: (3 minutes 1 seconds) by Ken Glover. Journal Text: 144:10:10 RealVideo Clip: (2 minutes 58 seconds) by Ken Glover. Journal Text: 144:12:26 QuickTime Video Clip: (1 minute 22 seconds; 985KB) by Peter Dayton. The astronauts are working on a very steep slope. Irwin tries to scoop up a rock left-handed but it falls as he raises the scoop, so he switches to his right hand. Scott plants his tongs in the ground and uses both hands to receive the rock as Irwin lifts it with his scoop. Scott lifts the rock above his chest-mounted camera for a good look and goes on to describe it. Meanwhile, Irwin pulls off a sample bag from his camera and plants his scoop in the ground. Dave decides, however, that it wouldn't fit in the bag Jim has readied so he puts it in the sample collection bag at the side of Jim's PLSS instead. Journal Text: 144:12:50 RealVideo Clip: (3 minutes 4 seconds) by Ken Glover. Journal Text: 144:15:45 RealVideo Clip: (2 minutes 52 seconds) by Ken Glover. Journal Text: 144:18:40 RealVideo Clip: (2 minutes 58 seconds) by Ken Glover. Journal Text: 144:18:42 QuickTime Video Clip: (1 minute 27 seconds; 1.05MB) by Peter Dayton. Jim comes downhill carrying his scoop, sending up sprays of dirt as he goes, to meet Dave who is photographing the Station 6 crater. They proceed around along the downslope side of the crater, about 110 feet below the rover. Journal Text: 144:21:38 RealVideo Clip: (2 minutes 58 seconds) by Ken Glover. Journal Text: 144:21:38 QuickTime Video Clip: (1 minute 53 seconds; 1.32MB) by Peter Dayton. Dave picks up five rock samples with his tongs while Jim plants his scoop in the ground and readies a sample bag for the rocks. After Jim places the rock bag in the sample collection bag on the side of Dave's PLSS, Dave borrows the hammer from Jim's PLSS and smashes open a large rock on the ground, then returns the hammer to Jim's PLSS. Journal Text: 144:23:21 RealVideo Clip: (2 minutes 44 seconds) by Ken Glover. Journal Text: 144:24:46 QuickTime Video Clip: (1 minute 5 seconds; 777KB) by Peter Dayton. The astronauts climb back to the upslope rim of the crater to dig a trench. Dave proceeds first as Jim pulls his scoop out of the ground. While waiting for Jim to catch up, Dave puts down the gnomon and shoots a couple of photographs. Journal Text: 144:26:03 RealVideo Clip: (2 minutes 52 seconds) by Ken Glover. Journal Text: 144:26:53 QuickTime Video Clip: (1 minute 39 seconds; 1.18KB) by Peter Dayton. Jim scoops the ground beside the gnomon seventeen times to dig a trench while Dave looks on. 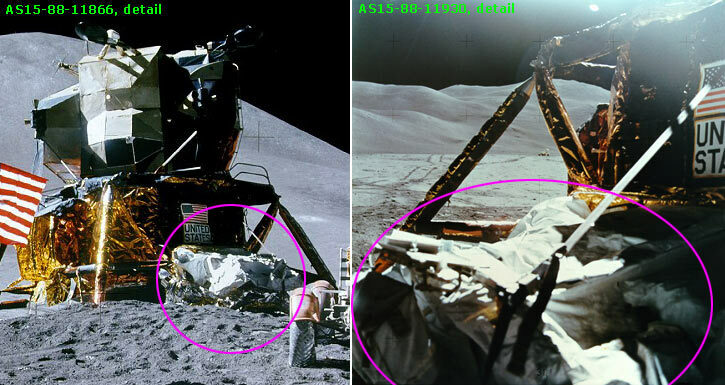 The sample bags attached to Jim's camera are clearly seen swinging while he works. Dave positions himself to photograph the trench by stepping into the crater below it, but loses his footing and falls in the steep, soft slope. Jim helps him to stand and to climb from the crater. Journal Text: 144:28:38 RealVideo Clip: (3 minutes 38 seconds) by Ken Glover. Journal Text: 144:32:13 RealVideo Clip: (2 minutes 44 seconds) by Ken Glover. Journal Text: 144:34:45 RealVideo Clip: (2 minutes 58 seconds) by Ken Glover. Journal Text: 144:37:36 RealVideo Clip: (2 minutes 58 seconds) by Ken Glover. Journal Text: 144:40:30 RealVideo Clip: (2 minutes 35 seconds) by Ken Glover. Journal Text: 144:42:53 RealVideo Clip: (3 minutes 7 seconds) by Ken Glover. Journal Text: 144:46:11 RealVideo Clip: (3 minutes 24 seconds) by Ken Glover. Journal Text: 144:49:13 RealVideo Clip: (2 minutes 58 seconds) by Ken Glover. Journal Text: 144:52:03 RealVideo Clip: (2 minutes 18 seconds) by Ken Glover. Journal Text: 144:54:15 RealVideo Clip: (2 minutes 41 seconds) by Ken Glover. Journal Text: 145:31:34 RealVideo Clip: (1 minutes 58 seconds). Journal Text: 145:33:38 RealVideo Clip: (2 minutes 50 seconds). Journal Text: 145:36:09 RealVideo Clip: (3 minutes 1 seconds). Journal Text: 145:36:18 QuickTime Video Clip: (1 minute 7 seconds; 810KB) by Peter Dayton. Jim collects a soil and rock sample with his scoop on the rim of Spur crater and places them in the sample bag held by Dave. Dave takes photographs, then places the bag in the sample collection bag on Jim's PLSS. Journal Text: 145:39:04 RealVideo Clip: (2 minutes 44 seconds). Journal Text: 145:41:43 RealVideo Clip: (3 minutes 36 seconds). Journal Text: 145:42:10 RealVideo Clip: (37 seconds) by Ken Glover. Clip from the NASA film Apollo 15: In the Mountains of the Moon. The narrator explains how the crystalline anorthosite Genesis Rock found by the astronauts was formed during the earliest history of the solar system, and how it offers clues to the formation of the earth, moon, and planets. Journal Text: 145:45:12 RealVideo Clip: (2 minutes 41 seconds). Journal Text: 145:47:58 RealVideo Clip: (2 minutes 55 seconds). Journal Text: 145:50:40 RealVideo Clip: (2 minutes 24 seconds). Journal Text: 145:52:51 RealVideo Clip: (3 minutes 44 seconds). Journal Text: 145:56:28 RealVideo Clip: (2 minutes 52 seconds). Journal Text: 145:59:17 RealVideo Clip: (2 minutes 55 seconds). Journal Text: 146:01:38 RealVideo Clip: (2 minutes 41 seconds). Journal Text: 146:04:15 RealVideo Clip: (2 minutes 50 seconds). Journal Text: 146:06:59 RealVideo Clip: (2 minutes 44 seconds). Journal Text: 146:09:31 RealVideo Clip: (2 minutes 21 seconds). Journal Text: 147:24:42 RealVideo Clip: (2 minutes 41 seconds). Journal Text: 147:27:08 RealVideo Clip: (3 minutes 3 seconds). Journal Text: 147:30:04 RealVideo Clip: (3 minutes 30 seconds). Journal Text: 147:33:26 RealVideo Clip: (2 minutes 58 seconds). Journal Text: 147:36:15 RealVideo Clip: (2 minutes 35 seconds). Journal Text: 147:38:40 RealVideo Clip: (2 minutes 41 seconds). Journal Text: 147:41:08 RealVideo Clip: (3 minutes 15 seconds). Journal Text: 147:45:03 RealVideo Clip: (1 minutes 49 seconds). Journal Text: 147:45:53 RealVideo Clip: (2 minutes 4 seconds). Journal Text: 147:47:59 RealVideo Clip: (2 minutes 35 seconds). Journal Text: 147:50:24 RealVideo Clip: (2 minutes 50 seconds). Journal Text: 147:53:15 RealVideo Clip: (3 minutes 4 seconds). Journal Text: 147:56:18 RealVideo Clip: (2 minutes 35 seconds). Journal Text: 147:58:44 RealVideo Clip: (3 minutes 1 seconds). Journal Text: 148:01:38 RealVideo Clip: (2 minutes 50 seconds). Journal Text: 148:04:15 4 minutes 4 seconds ( RealVideo Clip: 0.8 Mb or MPG Video Clip: 27 Mb ). Both clips by Ken Glover. Journal Text: 148:07:12 3 minutes 10 seconds ( RealVideo Clip: 0.8 Mb or MPG Video Clip: 28 Mb ). Both clips by Ken Glover. Journal Text: 148:10:11 3 minutes 24 seconds ( RealVideo Clip: 0.9 Mb or MPG Video Clip: 30 Mb ). Both clips by Ken Glover. Journal Text: 148:12:16 3 minutes 1 seconds ( RealVideo Clip: 0.8 Mb or MPG Video Clip: 27 Mb ). Both clips by Ken Glover. Journal Text: 148:14:39 QuickTime Video Clip: (52 seconds; 628KB) by Peter Dayton. Jim scoops two soil samples from the bottom of his 14 to 18-inch deep trench, pours them into the sample bag in his left hand, and returns to the rover. Journal Text: 148:15:19 2 minutes 41 seconds ( RealVideo Clip: 0.7 Mb or MPG Video Clip: 24 Mb ). Both clips by Ken Glover. Journal Text: 148:17:21 QuickTime Video Clip: (1 minute 45 seconds; 1.2MB) by Peter Dayton. While Jim returns his final trench soil sample to the rover, Dave drills a deep core sample about half-way in. He realizes he is still wearing his chest-mounted camera so he stops drilling and returns it to the rover. While Jim collects the penetrometer, Dave returns to the deep core sample and finishes drilling all the way in. When his auxiliary water warning tone is heard, sounding like a ringing cell phone, Dave stops to switch over to Aux Water. Journal Text: 148:17:54 3 minutes 7 seconds ( RealVideo Clip: 0.7 Mb or MPG Video Clip: 28 Mb ). Both clips by Ken Glover. Journal Text: 148:20:49 2 minutes 47 seconds ( RealVideo Clip: 0.7 Mb or MPG Video Clip: 24 Mb ). Both clips by Ken Glover. Journal Text: 148:23:27 2 minutes 47 seconds ( RealVideo Clip: 0.7 Mb or MPG Video Clip: 25 Mb ). Both clips by Ken Glover. Journal Text: 148:26:04 2 minutes 44 seconds ( RealVideo Clip: 0.7 Mb or MPG Video Clip: 24 Mb ). Both clips by Ken Glover. Journal Text: 148:28:41 3 minutes 13 seconds ( RealVideo Clip: 0.8 Mb or MPG Video Clip: 29 Mb ). Both clips by Ken Glover. Journal Text: 148:43:33 3 minutes 01 seconds ( RealVideo Clip: 0.8 Mb or MPG Video Clip: 27 Mb ). Both clips by Ken Glover. Journal Text: 148:46:30 4 minutes 13 seconds ( RealVideo Clip: 1.1 Mb or MPG Video Clip: 37 Mb ). Both clips by Ken Glover. Journal Text: 148:50:46 2 minutes 44 seconds ( RealVideo Clip: 0.7 Mb or MPG Video Clip: 24 Mb ). Both clips by Ken Glover. Journal Text: 148:53:17 2 minutes 47 seconds ( RealVideo Clip: 0.7 Mb or MPG Video Clip: 25 Mb ). Both clips by Ken Glover. Journal Text: 148:55:48 2 minutes 50 seconds ( RealVideo Clip: 0.7 Mb or MPG Video Clip: 25 Mb ). Both clips by Ken Glover. Journal Text: 148:58:45 3 minutes 56 seconds ( RealVideo Clip: 1.0 Mb or MPG Video Clip: 35 Mb ). Both clips by Ken Glover. Journal Text: 149:02:04 2 minutes 12 seconds ( RealVideo Clip: 0.6 Mb or MPG Video Clip: 19 Mb ). Both clips by Ken Glover. Journal Text: 149:04:05 3 minutes 36 seconds ( RealVideo Clip: 0.9 Mb or MPG Video Clip: 32 Mb ). Both clips by Ken Glover. Journal Text: 149:04:09 MPEG Video Clip: (51 seconds; 5.5MB) by Kipp Teague. Journal Text: 149:07:38 2 minutes 29 seconds ( RealVideo Clip: 0.6 Mb or MPG Video Clip: 22 Mb ). Both clips by Ken Glover. Journal Text: 149:09:57 3 minutes 41 seconds ( RealVideo Clip: 0.9 Mb or MPG Video Clip: 33 Mb ). Both clips by Ken Glover. Journal Text: 149:13:32 3 minutes 41 seconds ( RealVideo Clip: 0.8 Mb or MPG Video Clip: 29 Mb ). Both clips by Ken Glover. Journal Text: 163:34:36 3 minutes 21 seconds ( RealVideo Clip: 0.9 Mb or MPG Video Clip: 30 Mb ). Both clips by Ken Glover. Journal Text: 163:37:52 3 minutes 13 seconds ( RealVideo Clip: 0.8 Mb or MPG Video Clip: 28 Mb ). Both clips by Ken Glover. Journal Text: 163:40:56 2 minutes 29 seconds ( RealVideo Clip: 0.6 Mb or MPG Video Clip: 22 Mb ). Both clips by Ken Glover. Journal Text: 163:43:17 2 minutes 52 seconds ( RealVideo Clip: 0.7 Mb or MPG Video Clip: 26 Mb ). Both clips by Ken Glover. Journal Text: 163:47:38 2 minutes 50 seconds ( RealVideo Clip: 0.7 Mb or MPG Video Clip: 25 Mb ). Both clips by Ken Glover. Journal Text: 163:50:24 3 minutes 4 seconds ( RealVideo Clip: 0.8 Mb or MPG Video Clip: 27 Mb ). Both clips by Ken Glover. Journal Text: 163:53:22 2 minutes 41 seconds ( RealVideo Clip: 0.7 Mb or MPG Video Clip: 24 Mb ). Both clips by Ken Glover. Journal Text: 163:55:57 3 minutes 15 seconds ( RealVideo Clip: 0.8 Mb or MPG Video Clip: 29 Mb ). Both clips by Ken Glover. Journal Text: 163:59:01 3 minutes 36 seconds ( RealVideo Clip: 0.9 Mb or MPG Video Clip: 32 Mb ). Both clips by Ken Glover. Journal Text: 164:09:43 3 minutes 13 seconds ( RealVideo Clip: 0.8 Mb or MPG Video Clip: 28 Mb ). Both clips by Ken Glover. Journal Text: 164:12:51 2 minutes 13 seconds ( RealVideo Clip: 0.7 Mb or MPG Video Clip: 23 Mb ). Both clips by Ken Glover. Journal Text: 164:15:19 1 minutes 49 seconds ( RealVideo Clip: 0.5 Mb or MPG Video Clip: 16 Mb ). Both clips by Ken Glover. Journal Text: 164:17:02 2 minutes 44 seconds ( RealVideo Clip: 0.7 Mb or MPG Video Clip: 24 Mb ). Both clips by Ken Glover. Journal Text: 164:17:23 QuickTime Video Clip: (1 minutes 2 seconds; 752KB) by Peter Dayton. The deep core is finally extracted. Dave tugs at it by himself but finds he needs Jim's help for the final removal. After extraction, Dave carries the drill stem to the rover, with the drill and treadle still attached. Journal Text: 164:19:42 2 minutes 47 seconds ( RealVideo Clip: 0.7 Mb or MPG Video Clip: 25 Mb ). Both clips by Ken Glover. Journal Text: 164:19:45 QuickTime Video Clip: (1 minutes 38 seconds; 1.18MB) by Peter Dayton. Dave is holding the deep core sample tube horizontally on the geopallet at the back of the rover while he and Jim struggle to move the treadle by twisting it, to no avail. His voice heavy with dismay, he enlists Jim's help instead by asking him to twist the drill off the end of the stem. When it finally comes off, a little of the hard-won soil is seen spilling from the stem tube as Jim moves to place the drill on the rover. Dave removes his chest-mounted camera and moves out of view as he goes to place it on his seat. Journal Text: 164:21:57 QuickTime Video Clip: (1 minutes 20 seconds; 960KB) by Peter Dayton. Jim is seen taking pictures of his trench in this scene while Dave is heard on the audio track telling capcom Joe Allen which core caps (alpha, beta) he is attaching to either end of the drill stem. Journal Text: 164:22:22 2 minutes 50 seconds ( RealVideo Clip: 0.7 Mb or MPG Video Clip: 25 Mb ). Both clips by Ken Glover. Journal Text: 164:25:04 2 minutes 50 seconds ( RealVideo Clip: 0.8 Mb or MPG Video Clip: 28 Mb ). Both clips by Ken Glover. Journal Text: 164:28:03 2 minutes 50 seconds ( RealVideo Clip: 0.9 Mb or MPG Video Clip: 30 Mb ). Both clips by Ken Glover. Journal Text: 164:31:23 2 minutes 50 seconds ( RealVideo Clip: 0.5 Mb or MPG Video Clip: 18 Mb ). Both clips by Ken Glover. Journal Text: 164:33:20 3 minutes 07 seconds ( RealVideo Clip: 0.8 Mb or MPG Video Clip: 27 Mb ). Both clips by Ken Glover. Journal Text: 164:36:08 1 minute ( RealVideo Clip: 0.3 Mb or MPG Video Clip: 9 Mb ). Both clips by Ken Glover. Journal Text: 165:02:51 3 minutes 18 seconds ( RealVideo Clip: 0.8 Mb or MPG Video Clip: 29 Mb ). Both clips by Ken Glover. Journal Text: 165:06:04 3 minutes 03 seconds ( RealVideo Clip: 0.8 Mb or MPG Video Clip: 27 Mb ). Both clips by Ken Glover. Journal Text: 165:09:04 2 minutes 27 seconds ( RealVideo Clip: 0.6 Mb or MPG Video Clip: 22 Mb ). Both clips by Ken Glover. Journal Text: 165:11:22 2 minutes 12 seconds ( RealVideo Clip: 0.6 Mb or MPG Video Clip: 19 Mb ). Both clips by Ken Glover. Journal Text: 165:13:26 2 minutes 47 seconds ( RealVideo Clip: 0.7 Mb or MPG Video Clip: 24 Mb ). Both clips by Ken Glover. Journal Text: 165:20:46 3 minutes 33 seconds ( RealVideo Clip: 0.9 Mb or MPG Video Clip: 31 Mb ). Both clips by Ken Glover. Journal Text: 165:24:12 2 minutes 39 seconds ( RealVideo Clip: 0.7 Mb or MPG Video Clip: 24 Mb ). Both clips by Ken Glover. Journal Text: 165:26:44 2 minutes 39 seconds ( RealVideo Clip: 0.8 Mb or MPG Video Clip: 27 Mb ). Both clips by Ken Glover. Journal Text: 165:29:16 to 165:31:31 QuickTime Video Clip: (2 minutes 42 seconds; 1.9MB) by Peter Dayton. Exploring the rille. The rover camera scene opens with closeup views of boulders on the far rille wall, the camera panning left and stopping repeatedly. Off-camera, Dave takes 500-mm pictures of the rille and describes a crater in the far wall. The camera zooms out and pans right to find Jim carrying a scoop and looking at the surface. He walks to the right to join Dave while the camera follows. Dave points out talus features on the far rille slope as the camera finds them both looking off to the left at the rille. Dave's 500-mm camera is seen clearly. Journal Text: 165:29:42 3 minutes 00 seconds ( RealVideo Clip: 0.8 Mb or MPG Video Clip: 27 Mb ). Both clips by Ken Glover. Journal Text: 165:31:31 MPEG Video Clip: (1 minutes 7 seconds; 7MB) by Kipp Teague. Dave and Jim are looking at the rille off-camera to the left. Dave takes pictures with the 500-mm camera. Jim goes off-camera to the right as Dave begins a summary description of the rille wall. Still talking, he begins walking but trips on a rock and falls forward to the ground, burying the camera in the dust. Journal Text: 165:32:00 QuickTime Video Clip: (41 seconds) by Peter Dayton. Shorter version of the previous clip. Journal Text: 165:32:38 2 minutes 55 seconds ( RealVideo Clip: 0.8 Mb or MPG Video Clip: 26 Mb ). Both clips by Ken Glover. Journal Text: 165:35:29 3 minutes 01 seconds ( RealVideo Clip: 0.8 Mb or MPG Video Clip: 27 Mb ). Both clips by Ken Glover. Journal Text: 165:35:54 MPEG Video Clip: (1 minutes 24 seconds; 8.6MB) by Kipp Teague. Rover television pans showing Dave putting the 500-mm camera on the rover seat and collecting tongs and the gnomon from the rover, followed by a view of him further afield to the right as he goes down towards the rille, then climbs back up to test ease of return on the slope. Satisfied, he begins to return down to the rille, pausing to discuss sampling with Jim (off-camera). Journal Text: 165:36:21 QuickTime Video Clip: (1 minutes 22 seconds; 984KB) by Peter Dayton. Scott moves from the rover down into the rille. The television camera follows and zooms in to watch him down among the rocks on the western rille wall. Journal Text: 165:37:49 to 165:39:20 QuickTime Video Clip: (1 minutes 35 seconds; 1.14MB) by Peter Dayton. The camera follows Dave's descent into the rille. As it pans right, Jim comes into view carrying a scoop and descending to join Dave, who pauses to study big angular blocks and to offer a geologic description. Dave gets ready to hammer a fragment from one of the rocks. As Jim reaches him he plants the gnomon in position then capcom Joe Allen sends instructions from Houston while Dave picks up a hammer from Jim's PLSS. Journal Text: 165:38:25 2 minutes 35 seconds ( RealVideo Clip: 0.7 Mb or MPG Video Clip: 23 Mb ). Both clips by Ken Glover. Journal Text: 165:39:04 QuickTime Video Clip: (1 minutes 19 seconds) by Peter Dayton. CapCom Joe Allen sends instructions from Houston while Dave picks up a hammer from Jim's PLSS. Jim walks left to position himself for sample photography. Dave plants his tongs in the ground then squats low to hammer off a rock sample. The first fragment flies away from view so he hammers again and they watch where the chip flies more carefully. Dave picks up his tongs and walks over to collect the fragment. Journal Text: 165:40:52 3 minutes 01 seconds ( RealVideo Clip: 0.8 Mb or MPG Video Clip: 27 Mb ). Both clips by Ken Glover. Journal Text: 165:43:46 3 minutes 44 seconds ( RealVideo Clip: 1.0 Mb or MPG Video Clip: 33 Mb ). Both clips by Ken Glover. Journal Text: 165:47:40 2 minutes 44 seconds ( RealVideo Clip: 0.7 Mb or MPG Video Clip: 24 Mb ). Both clips by Ken Glover. Journal Text: 165:50:04 3 minutes 10 seconds ( RealVideo Clip: 0.7 Mb or MPG Video Clip: 24 Mb ). Both clips by Ken Glover. Journal Text: 165:50:44 to 165:52:15 QuickTime Video Clip: (1 minutes 35 seconds; 1.14MB) by Peter Dayton. The astronauts begin to climb out of the rille, Dave first, heading back to the rover. Joe Allen sends up details of a request for a rake sample, soil sample and double core sample beside the rover. Dave helps Jim set up a photograph and continues up the slope. Jim follows after taking picture AS15-82-11147. Dave finds an interesting boulder, puts the gnomon on the ground and makes Jim take its picture. Journal Text: 165:52:17 to 165:53:37 QuickTime Video Clip: (1 minutes 24 seconds; 1MB) by Peter Dayton. Jim photographs the boulder and Dave picks up the gnomon. They proceed uphill to the rover. As he disappears off-camera to the left, Dave asks Joe Allen to repeat his sample requirements. Jim comes along uphill and the camera pans left, following him to the rover. Journal Text: 165:53:04 2 minutes 44 seconds ( RealVideo Clip: 0.7 Mb or MPG Video Clip: 24 Mb ). Both clips by Ken Glover. Journal Text: 165:54:07 QuickTime Video Clip: (1 minutes 22 seconds) by Peter Dayton. While Jim is center-frame preparing to rake, Dave backs off-camera to the left to photograph the activity. The rover camera zooms in to catch good views of soil spilling from the rake. Jim requests a sample bag and Dave comes forward with one, kicking soil into Jim's sampling area on his approach. Jim pours the rake samples into the bag held by Dave, who offers a running commentary on the samples tilting into the bag in his hand. Jim rakes again and pours his booty into Dave's collection bag once more, while Dave speculates that it might be a good spot to dig a trench because of the different soil layer colours revealed when he kicks up the topsoil. Journal Text: 165:55:36 3 minutes 30 seconds ( RealVideo Clip: 0.9 Mb or MPG Video Clip: 31 Mb ). Both clips by Ken Glover. Journal Text: 165:56:48 to 165:58:27 QuickTime Video Clip: (1 minutes 32 seconds; 1.1MB) by Peter Dayton. Jim rakes up two more fragment samples and pours them into Dave's collection bag. Dave suggests performing a core sample to Houston. Joe Allen responds that they might even do a double core. Dave seals the sample bag. Journal Text: 165:59:02 2 minutes 55 seconds ( RealVideo Clip: 0.7 Mb or MPG Video Clip: 26 Mb ). Both clips by Ken Glover. Journal Text: 166:01:52 2 minutes 52 seconds ( RealVideo Clip: 0.7 Mb or MPG Video Clip: 26 Mb ). Both clips by Ken Glover. Journal Text: 166:03:35 QuickTime Video Clip: (1 minutes 4 seconds; 770KB) by Peter Dayton. Jim, at right, positions the core tube on the ground and Dave takes his picture while he pushes it in. Jim hammers right-handed 24 times before switching to his left hand for another 20 swings, missing a couple of times at the beginning. Occasional bumps on the soundtrack sound uncannily like hammer impacts, especially sounds at the 24-second mark, and three sounds at 36 seconds which coincide with impacts of the hammer on the T-shaped extension handle. The rover camera zooms in for a closeup of the final strokes. Journal Text: 166:04:39 2 minutes 41 seconds ( RealVideo Clip: 0.7 Mb or MPG Video Clip: 24 Mb ). Both clips by Ken Glover. Journal Text: 166:07:15 2 minutes 41 seconds ( RealVideo Clip: 0.7 Mb or MPG Video Clip: 24 Mb ). Both clips by Ken Glover. Journal Text: 166:09:23 QuickTime Video Clip: (47 seconds; 563KB) by Peter Dayton. The camera zooms in while Dave squats down low to pick up a 9.6 kg rock, later dubbed Great Scott, the second largest returned from the moon. He picks up the gnomon and the camera zooms out as he returns to the rover. Journal Text: 166:09:44 3 minutes 07 seconds ( RealVideo Clip: 0.8 Mb or MPG Video Clip: 28 Mb ). Both clips by Ken Glover. Journal Text: 166:17:56 2 minutes 58 seconds ( RealVideo Clip: 0.8 Mb or MPG Video Clip: 26 Mb ). Both clips by Ken Glover. Journal Text: 166:20:51 2 minutes 52 seconds ( RealVideo Clip: 0.7 Mb or MPG Video Clip: 25 Mb ). Both clips by Ken Glover. Journal Text: 166:23:35 2 minutes 41 seconds ( RealVideo Clip: 0.7 Mb or MPG Video Clip: 24 Mb ). Both clips by Ken Glover. Journal Text: 166:47:51 2 minutes 47 seconds ( RealVideo Clip: 0.7 Mb or MPG Video Clip: 24 Mb ). Both clips by Ken Glover. Journal Text: 166:50:32 2 minutes 44 seconds ( RealVideo Clip: 0.7 Mb or MPG Video Clip: 24 Mb ). Both clips by Ken Glover. Journal Text: 166:53:07 3 minutes 04 seconds ( RealVideo Clip: 0.8 Mb or MPG Video Clip: 27 Mb ). Both clips by Ken Glover. Journal Text: 166:56:01 3 minutes 13 seconds ( RealVideo Clip: 0.8 Mb or MPG Video Clip: 29 Mb ). Both clips by Ken Glover. Journal Text: 166:59:10 3 minutes 15 seconds ( RealVideo Clip: 0.8 Mb or MPG Video Clip: 29 Mb ). Both clips by Ken Glover. Journal Text: 167:02:55 2 minutes 24 seconds ( RealVideo Clip: 0.6 Mb or MPG Video Clip: 21 Mb ). Both clips by Ken Glover. Journal Text: 167:04:40 3 minutes 04 seconds ( RealVideo Clip: 0.8 Mb or MPG Video Clip: 27 Mb ). Both clips by Ken Glover. Journal Text: 167:07:35 3 minutes 44 seconds ( RealVideo Clip: 0.8 Mb or MPG Video Clip: 26 Mb ). Both clips by Ken Glover. Journal Text: 167:10:36 2 minutes 58 seconds ( RealVideo Clip: 1.0 Mb or MPG Video Clip: 33 Mb ). Both clips by Ken Glover. Journal Text: 167:14:20 1 minutes 41 seconds ( RealVideo Clip: 0.4 Mb or MPG Video Clip: 15 Mb ). Both clips by Ken Glover. Journal Text: 167:16:28 1 minutes 43 seconds ( RealVideo Clip: 0.4 Mb or MPG Video Clip: 15 Mb ). Both clips by Ken Glover. Journal Text: 167:18:06 2 minutes 52 seconds ( RealVideo Clip: 0.7 Mb or MPG Video Clip: 25 Mb ). Both clips by Ken Glover. Journal Text: 167:18:39 to 167:19:50 QuickTime Video Clip: (1 minutes 16 seconds; 920KB) by Peter Dayton. Here, Dave cancels the first stamp of a new issue commemorating a decade of US achievements in space. The initial view shows him beside the MESA with a mountain in the background behind the lunar module. As he narrates the procedure he's performing, the camera zooms in affording a view of the stamped envelope (and his cuff checklist) and Dave cancels the stamp. Journal Text: 167:20:52 2 minutes 50 seconds ( RealVideo Clip: 0.7 Mb or MPG Video Clip: 25 Mb ). Both clips by Ken Glover. Journal Text: 167:22:06 QuickTime Video Clip: (50 seconds; 0.8MB) by Peter Dayton. With the lunar module and a mountain as a backdrop, Scott recreates Galileo's famous gravity experiment in a low-gravity vacuum by letting a hammer and falcon's feather fall to the ground. Journal Text: 167:22:06 MPEG Video Clip: (49 seconds; 6.4MB) by Kipp Teague. Same as above: the hammer and feather experiment. Journal Text: 167:23:35 2 minutes 50 seconds ( RealVideo Clip: 0.7 Mb or MPG Video Clip: 25 Mb ). Both clips by Ken Glover. Journal Text: 167:26:16 1 minutes 41 seconds ( RealVideo Clip: 0.4 Mb or MPG Video Clip: 15 Mb ). Both clips by Ken Glover. Journal Text: 167:41:30 RealVideo Clip: (2 minutes 2 seconds) by Ken Glover. This clip from the film Apollo 15: In the Mountains of the Moon shows a postflight press conference where Dave Scott describes the memorial to fallen astronauts he left on the moon. The clip begins with scenes of reentry, splashdown, and the astronauts emerging from the recovery helicopter onto the deck of the USS Ticonderoga. A scene follows of the crew at the press conference where Scott explains that he left a small memorial on the lunar soil about twenty feet north of the rover's final parking spot. Journal Text: 167:47:52 2 minutes 58 seconds ( RealVideo Clip: 0.8 Mb or MPG Video Clip: 26 Mb ). Both clips by Ken Glover. Journal Text: 167:50:46 2 minutes 58 seconds ( RealVideo Clip: 0.8 Mb or MPG Video Clip: 27 Mb ). Both clips by Ken Glover. Journal Text: 167:51:06 QuickTime Video Clip: (1 minutes 37 seconds; 1.17MB) by Peter Dayton. With the rover at its final parking place about 300 feet behind the lunar module, this scene opens with a rightward camera pan across the surface. When the lunar module comes into view the camera zooms in and Irwin can be seen behind the right hand, plus-Y strut. At 1 minute 10 seconds, Scott comes into view running back to the lunar module to dust off Irwin before he re-enters the spacecraft. Journal Text: 167:53:39 2 minutes 52 seconds ( RealVideo Clip: 0.7 Mb or MPG Video Clip: 25 Mb ). Both clips by Ken Glover. Journal Text: 167:56:20 2 minutes 35 seconds ( RealVideo Clip: 0.7 Mb or MPG Video Clip: 23 Mb ). Both clips by Ken Glover. Journal Text: 167:59:31 3 minutes 06 seconds ( RealVideo Clip: 0.8 Mb or MPG Video Clip: 28 Mb ). Both clips by Ken Glover. Journal Text: 168:01:49 1 minutes 38 seconds ( RealVideo Clip: 0.4 Mb or MPG Video Clip: 14 Mb ). Both clips by Ken Glover. Journal Text: 170:55:17 1 minutes 38 seconds ( RealVideo Clip: 1.2 Mb or MPG Video Clip: 42 Mb ). Both clips by Ken Glover. Journal Text: 170:58:33 3 minutes 27 seconds ( RealVideo Clip: 0.9 Mb or MPG Video Clip: 30 Mb ). Both clips by Ken Glover. Journal Text: 171:01:52 2 minutes 47 seconds ( RealVideo Clip: 0.7 Mb or MPG Video Clip: 25 Mb ). Both clips by Ken Glover. Journal Text: 171:04:31 2 minutes 38 seconds ( RealVideo Clip: 0.7 Mb or MPG Video Clip: 24 Mb ). Both clips by Ken Glover. Journal Text: 171:06:58 2 minutes 58 seconds ( RealVideo Clip: 0.8 Mb or MPG Video Clip: 26 Mb ). Both clips by Ken Glover. Journal Text: 171:09:50 5 minutes 45 seconds ( RealVideo Clip: 1.4 Mb or MPG Video Clip: 51 Mb ). Both clips by Ken Glover. Journal Text: 171:16:06 2 minutes 21 seconds ( RealVideo Clip: 0.6 Mb or MPG Video Clip: 21 Mb ). Both clips by Ken Glover. Journal Text: 171:17:37 2 minutes 21 seconds ( RealVideo Clip: 1.0 Mb or MPG Video Clip: 36 Mb ). Both clips by Ken Glover. Journal Text: 171:21:29 6 minutes 16 seconds ( RealVideo Clip: 1.6 Mb or MPG Video Clip: 56 Mb ). Both clips by Ken Glover. Journal Text: 171:21:29 RealVideo Clip: (6 minutes 16 seconds). Journal Text: 171:27:40 3 minutes 01 seconds ( RealVideo Clip: 0.8 Mb or MPG Video Clip: 27 Mb ). Both clips by Ken Glover. Journal Text: 171:30:36 2 minutes 44 seconds ( RealVideo Clip: 0.7 Mb or MPG Video Clip: 24 Mb ). Both clips by Ken Glover. Journal Text: 171:33:06 2 minutes 52 seconds ( RealVideo Clip: 0.7 Mb or MPG Video Clip: 25 Mb ). Both clips by Ken Glover. Journal Text: 171:35:52 2 minutes 52 seconds ( RealVideo Clip: 1.1 Mb or MPG Video Clip: 37 Mb ). Both clips by Ken Glover. Journal Text: 171:36:25 QuickTime Video Clip: (1 minutes 21 seconds) by Peter Dayton. Ascent of the Falcon: view from the rover's television camera. Ignition occurs at the 54-second mark and the Falcon climbs off-camera within three seconds just as "Air Force Song" can be heard from the onboard tape recorder. Spacecraft foil and surface debris fly in all directions. The dust stirred up by the engine clears remarkably quickly, within about 12 seconds. In this first-ever exterior television record of a lunar lift-off, the planned attempt to follow the climbing ascent stage was omitted owing to the camera's tilting difficulties (the camera problem is discussed in Return to the LM after 166:55:05). Journal Text: 171:37:25 MPEG Video Clip: (1 minute; 1.9MB) by Mick Hyde. Ascent of the Falcon: silent 16-mm view from behind the lunar module pilot's window. Strips of foil fly sideways at ignition. The spacecraft pitches unevenly during ascent, revealing its own shadow and then the descent stage on the ground, briefly, at the 7-second mark. Astronaut- and rover-disturbed, darker soil and the ALSEP area can also be picked out. The boulder-littered wall of Hadley Rille comes into view at 23 seconds. The Falcon yaws right and flies along the rille like a helicopter ride over the Grand Canyon. Journal Text: 171:40:05 2 minutes 52 seconds ( RealVideo Clip: 0.5 Mb or MPG Video Clip: 19 Mb ). Both clips by Ken Glover. Journal Text: 171:42:25 3 minutes 24 seconds ( RealVideo Clip: 0.9 Mb or MPG Video Clip: 30 Mb ). Both clips by Ken Glover. Journal Text: 171:45:06 3 minutes 24 seconds ( RealVideo Clip: 0.6 Mb or MPG Video Clip: 22 Mb ). Both clips by Ken Glover. the crew up to the rendezvous between Falcon and Endeavour. 171:47:30 RealVideo Clip: (4 minutes 7 seconds). 171:51:30 RealVideo Clip: (3 minutes 33 seconds). 171:55:00 RealVideo Clip: (4 minutes 27 seconds). 171:59:20 RealVideo Clip: (47 seconds). A partial Rover television pan performed by Ed Fendell. 211:24:15 RealVideo Clip: (10 minutes 18 seconds). 211:28:15 RealVideo Clip: (2 minutes 12 seconds). The following clips are taken from a television broadcasts by the crew during the return to Earth. 270:27:45 MPG Video Clip: 1 minutes 57 seconds ( 1Mb ). 270:37:14 MPG Video Clip: 1 minutes 28 seconds ( 13 Mb ). 270:38:40 MPG Video Clip: 0 minutes 56 seconds ( 8 Mb ). 270:39:30 MPG Video Clip: 1 minutes 28 seconds ( 13 Mb ). 270:40:55 MPG Video Clip: 1 minutes 45 seconds ( 16 Mb ). 270:42:37 MPG Video Clip: 2 minutes 30 seconds ( 22 Mb ). 270:45:05 MPG Video Clip: 1 minutes 45 seconds ( 16 Mb ). 270:46:47 MPG Video Clip: 0 minutes 56 seconds ( 8 Mb ). 270:47:40 MPG Video Clip: 1 minutes 35 seconds ( 14 Mb ). 270:49:13 MPG Video Clip: 2 minutes 53 seconds ( 26 Mb ). 270:52:03 MPG Video Clip: 2 minutes 33 seconds ( 23 Mb ). 270:55:43 MPG Video Clip: 4 minutes 12 seconds ( 38 Mb ). 270:59:51 MPG Video Clip: 3 minutes 15 seconds ( 29 Mb ).